It is God Krishna who said that the entire world follows the actions exemplified by the great people. Madhva gurus who are the ardent devotees of Rama and Krishna have demonstrated the above saying through their Matru Bhakti. Not so surprisingly the pack of Madhva gurus is led by none other than Madhvacharya himself who cared for his mother Vedavati on number occasions including the dreadful incident of a demon trying to kill her in the form of terrible snake. He has also shown his concern when she lamented on young Vasudeva’s decision to renounce the worldly pleasures by taking up Sanyasa. He consoled her that he would take up Sanyasa after she begets another male child. This is how Madhvacharya respected his worldly mother, though she wasn’t the mother in his Moola Rupa. Thus Acharya Madhva shines as the brightest star of Matru Bhakti in the just concluded millennia. Second in the line comes Sri Vadiraja Tirtha, who exhibited Matru Bhakti by accomplishing a great literary feat. Vadiraja wrote a magnum opus called as LakshalankAra (One Lakh Decoratives) by offering the inner meanings for 1,00,000 important words used by Sage Veda Vyasa in Maha Bharata. He wrote this painstakingly voluminous book to fulfill his mother’s wish of offering one lakh ornaments to the God. Such was his Mantru Bhakti which finally resulted into a great treatise on Maha Bharata. He also gave a metal statue of his to the mother when the latter was anguished for not able to visit her beloved son. This is yet another evidence of his devotion towards the mother and even today one can see this image in Sonda Vadiraja Matha. Life history of Raghuttama Tirtha narrates that his mother was having boundless love for her son who became a Sanyasi. And the result of this love is her image being carved on the Brindavana. But for me it appears that Sri Raghuttama’s devotion towards the mother dates back to Dwapara yuga as he is believed to be the incarnation of Niruruti (ruler of Nairuthi direction) who was born as Ghatotkacha, the rakshasa son of Bhima. It is well known that Hidimbi, the mother of Ghatothkacha, stayed alone after her marriage with Bhima. Ghatothkacha grew under the care and compassion of Hidimbi but he always had a special place in his heart for the father. This becomes evident when he joins Kurukshetra battle on the call of his father and attains martyrdom. I feel that Raghuttama Tirtha must have carried the ‘vAsana’ of Matru Bhakti from his previous incarnation. I believe that this vAsana was so strong that he instantaneously got bonded with the mother in his human form and made her an eternal emblem of Matru Bhakti by giving a place on his Brindavana. A sanyasi is supposed to renounce all known and unknown bondages of this eternal “samsAra.” But Sri Raghuttama has chosen to be different by installing his mother’s face on his brindavana. This is but natural as he wanted to repay his debt to Hidimbi who raised Gahtotkacha all alone and gave the combined love of father and mother. Sri Raghuttama celebrated the warmth of mother by creating the image of her on his Brindavana. Apart from the above mythological ruminations, I have a personal story to tell. Sri Raghuttama, who has cherished the boundless love of Hidimba as mother is of so much inspiration to me to revere and respect not only my mother but all mother-like women. I am the only son but the elder sibling to my parents. My mother, during her 7th month of pregnancy, visited Tirukkovilur along with husband and other relatives. It was her maiden visit and she was fascinated to learn about Raghuttama and his Matru Bhakti. So, she thought of giving the saint’s name should she be blessed with a baby boy. That is how I got my name. Even to this day, my father teases me that I have a greater love for mother than for him which I can't deny. I love and care for my father but I sprint by hearing the voice of my mother calling while I go jogging when father calls! Is my this reaction influenced by the very name of great Matru Bhakta i.e. Sri Raghuttama Tirtha? I wish it could be true for the reason that I would feel blessed that I am following the Dharma exhibited by Sri Raghuttama. It is nothing but divine fortune for young Maadhvas to learn from these larger-than-life pictures of our Guru parampara. I request every young lad to read and understand the life stories of our distinguished Gurus beyond the miracles and myths that usually associated and made famous with them. Highly appreciate author in spending lot of valuable time in researching and recording the key details of Madhwa parampare. 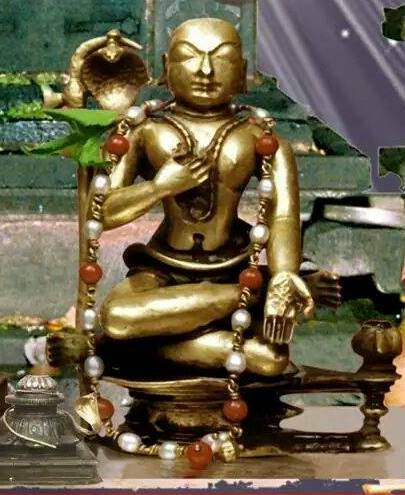 Thanks for sharing unknown details about Gahtotkacha, Hidimba and the connection to Sri RaghothamaThirtharu. Thanks for your dedication and hardwork. Your mother is very thoughtful of your name and you can certainly prove its worth by publishing more articles on this space. Hidimbi story is not known to many and Niruriti incarnatioon is unheard!! Dwaitam reconciles the events well and yet proves the same point Hari - Vayu status. True and meaningful practical article. I appreciate the writer. Please make more articles for the benefit of younger generations to know unknown facts.